Maximum information with minimum fuss. 70 to 80% of cable lines are in a voltage range of up to 20 kV. 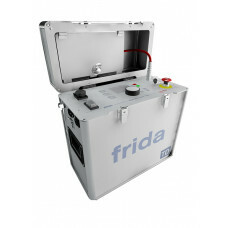 All these cables can be tested with frida TD easily and quickly. Additionally examination of the aging condition without damage to cable. The intuitive BAUR user interface, the integrated tan delta measurement, compact dimensions and low weight make frida TD the ideal companion for network maintenance personnel and service providers. More efficiency, more profitability with BAUR frida TD. Cable lines are often replaced only due to their age without knowing their actual condition. Thereby, often intact sections are replaced. This results in considerable investments. On the contrary, the cost for high voltage testing and diagnosis is comparatively low. With frida TD, the condition of cable lines in the local network can be ascertained effectively and exhaustively. This enables a targeted investment and maintenance of medium voltage networks.